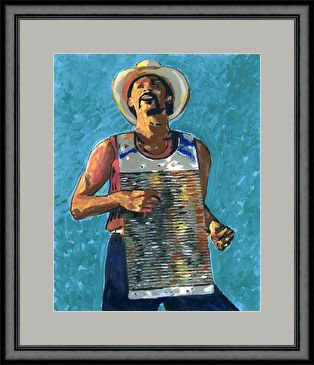 'Zydeco Joe' an indescribable feel for Zydeco music. I tried to portray the fun he generates when he plays and sings in the colors. Feel the heat and the cool in the red and the blue. Prints for sale at $29.99 and up plus postage.. Click Image to order. 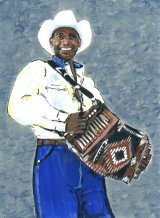 The self proclaimed King of Zydeco, the late Boozoo Chavis. 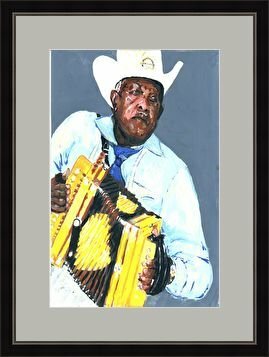 I saw him at Jazz Fest the year before he died. He lives on in his recordings and wonderful stories of his life. 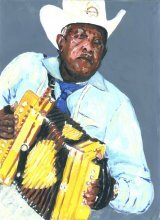 Prints for sale, order by clicking on image. 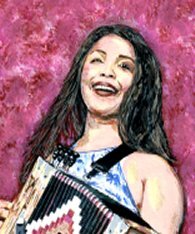 Zydeco Sweetheart Rosie Ledet: e-mail for prints. All the above prints are 8x10 on heavy paper available from a California publisher. Just click image to order. 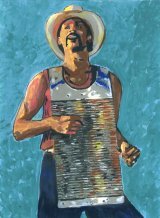 For signed Artists Proofs direct from artist, e-mail: , Signed Artists Proofs are 8X10 acid free paper for $49.99 each mailed First Class. Pay Pal and checks accepted. Stop in my paintings web page for more New Orleans Art Prints at www.figstreet.com/studio/ or ask me about doing a portrait from a photograph. See other samples on my web page.